In essence, what is desired in Gongfu Cha is a brew that tastes good and is satisfying to the soul. Tea masters in China and other Asian tea cultures study for years to perfect this method. Gong fu tea ceremony, also called as Cha dao tea ceremony, is a way of life in Fujian, China, particularly ZangZhou and Quanzhou. Gong Fu, also spelt as Kong Fu, means talented in making tea. The term Gong Fu Cha Dao, therefore, means being talented in the ways of tea. It is also referred to as a Fujian tea ceremony wherein the tea plays the lead and is the one put on show, quite unlike Japanese or Korean tea ceremonies. The ceremony’s procedures are made to bring out the finest flavour of tea. 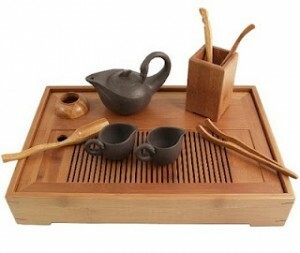 Gong Fu Cha Teaset, Traditional way to make tea : try this method of ancestral preparation and let yourself be surprised ! Free shipping worldwide.